After months of struggling, it's official, Icelandic budget airline WOW Air has ceased all operations. The airline announced early this morning that it had ended all operations effective immediately, and canceled all remaining flights. WOW has set up a page with recommendations for those passengers who are booked on flights that will now never take off. For starters, you can request a chargeback from the credit card company that you booked your flight with. For those who have traveled recently with a WOW flight, and need a flight home, WOW Air recommends requesting 'rescue fares' from other airlines. These are discounted fares that other airlines offer when an airline goes under. WOW says it will publish information on these potential options shortly. Update: A list of airlines offering rescue fares is now available. Icelandair has set up a page with options for stranded WOW Air passengers that were due to return between March 28 and April 11. If you purchased trip insurance or paid for the flight with a credit card that had trip coverage, it should cover any unforeseen expenses due to the cancellations. It's been a long drop for WOW, who burst onto the scene with rock-bottom fares to Europe and unique branding. They were even awarded the 'low cost airline of the year' by CAPA in 2018. The consensus seems to be that they grew too fast, launching flights from more than a dozen U.S. cities, and from 3 here in Canada (besides Toronto and Montreal, they were briefly available for purchase from Vancouver). But around last fall, it became clear that trouble lay ahead for WOW. Rival Icelandair backed away from a takeover of WOW not once, but twice. So did Indigo Partners, a hedge fund that is known for turning around struggling budget airlines. 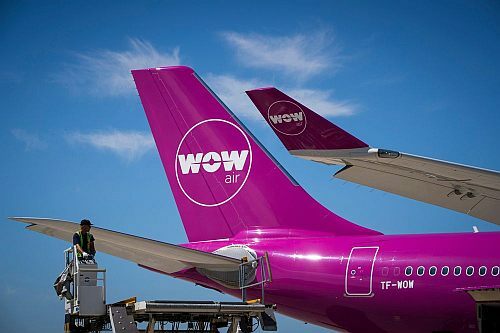 By December of 2018, WOW was forced to cancel many of it's U.S. routes and sell nearly half of their aircraft. It was around this time I stopped posting deals from WOW, as it felt probable that flights from Canada could also be cancelled. After a period of high fuel prices, times have been tough for budget airlines. WOW Air isn't the first trans-Atlantic budget carrier to collapse, as we saw with Primera Air here in Toronto last October. Norwegian Air, currently offering flights out of Hamilton, is also known to be struggling. A YYZ Deals follower named Laurent sent me this photo of Porto, Portugal that she took while presumably taking advantage of those crazy $281 flights on Sunwing. I've had a fair number of requests over the last few months, especially from people that aren't on Facebook, asking if there was any way they could be notified by e-mail when I post a deal. So on Thursday evening I reported a deal to Buenos Aires, Argentina and Santiago, Chile - both were showing up on airfare.com for an incredible price of $530 roundtrip after tax.